Bed and Breakfasts near Towcester Racecourse for 1 night from Tue Apr 23, 2019 to Wed Apr 24, 2019 within 25 miles, in an Average Nightly price range of £1 to £200. 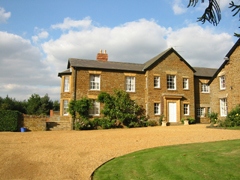 Set in the heart of the Northamptonshire countryside close to Silverstone and with easy access to the M1 M40 & rail network Bay Tree Cottage offers a selection of B&B and self-catering accommodation with Grade II listed buildings full of charm & character plus a modern and contemporary new barn conversion. Ranging from a one-bed studio two-bed cottages and 3-bed apartments with up to a total of 36 beds spaces available Bay Tree Cottage can offer accommodation for both small and large groups so is perfect for group events family holidays romantic retreats or busy businessmen. Well behaved children & dogs welcome too! (NB There is a small additional charge for dogs of �7.50 per night) Also in our new conversion is a delightful function room which is available for hire for private meetings events and dinners. . Ideal for holiday makers or guests attending nearby events our hotel offers easy access to numerous local attractions. Conveniently located only 3 miles from the town centre and 2 miles from Northampton train station our guests will find it easy to explore the area and places of interest such as the Northampton Open Market only 3 miles from the hotel. For sporting fans both Towcester Racecourse (9 miles) and the world renowned Silverstone Racing Circuit (10 miles) are close by making this a perfect place to stay if you re planning a trip to these iconic tracks. All rooms feature a comfy king size bed with four plump pillows and a cosy duvet. Guests can enjoy a wide variety of food and drink choices within a short distance of the hotel. Early/Late Check-In/Out Service if you re looking to make the most of your day we can offer an Early Check-In service from 12:00noon and a Late Check-Out Service until 2pm so you have more time to relax - cost is �10 per service per room subject to availability - bookable direct by telephoning the hotel. We are a pet friendly hotel and allow up to 2 domestic pets per stay. This is at an additional charge of �20 per pet per stay. Please contact LateRooms to arrange this to be added to your booking and for further details on charges and terms and conditions. Please note that Guide dogs Hearing dogs and other animals to aid disability are exempt from charge. Deep in the peaceful Northamptonshire countryside Farthingstone Hotel & Golf Course offers bright airy accommodation. It has a restaurant bar a challenging golf course and a squash court. Surrounded by tranquil farmland that is perfect for walking the Farthingstone is 15 minutes drive away from the M1 motorway. Silverstone Race Circuit can be reached in 20 minutes by car. All of the modern rooms feature a flat screen TV tea and coffee facilities and a private shower room. Some of the rooms also enjoy views of the local countryside. The Farthingstone Hotel restaurant overlooks the final holes of the course serving traditional British food. The relaxing bar and lounge has a wood burner and leads to a games room with 2 snooker tables. With the course including woodland water large fairways and well-kept greens guests have excellent golf facilities on their doorstep. Golf buggies and a well-stocked golf shop are available.